Three games in three nights, including a double-header return trip to Belfast Giants, finished off with a home match against league leaders Cardiff Devils. Weekends don’t come much tougher for Fife Flyers but head coach Todd Dutiaume wants his players to set down a marker against the two top teams in the Elite League. Six points are up for grabs, and Flyers cannot afford to let them slip away if they are to retain hopes of catching third placed Nottingham Panthers, but also to keep ahead of the chasing pack, with just six points separating the Kirkcaldy team from 10th place. With a full-strength line-up at his disposal, and the team looking to get into play-off form, Dutiaume (inset) expects his players to compete across all 180 minutes. “We’re carrying the extra import and we’ll have all our young guys back from GB duty so we have a lot more options,” Dutiaume said. “It’s a case of spreading it out and making sure guys minutes are managed, and it’s also making sure players realise the significance of a weekend like this. “If we have any play-off aspirations these are the teams you have to be able to beat, and not just by fluke, you have to go out and beat them. “We’ve proved that against both these teams earlier in the season when we won in Cardiff and had a couple of wins over Belfast, but that’s ancient history now. Flyers are currently a .500 hockey team having registered eight wins and eight defeats in the past 16 games, with four-point weekends proving hard to come by. 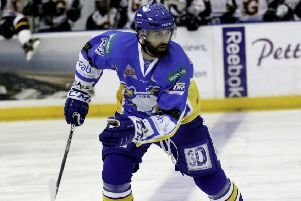 Some of those losses have included a losing bonus point, such as the penalty shots defeat to Nottingham on Sunday, a game Dutiaume felt was there for the taking. It followed a 24-hour return trip to Guildford on Saturday where Flyers held their nerve to seal an overtime win after being pegged back from 3-1 ahead in the third period. “It was one of our strongest performances for a while,” Dutiaume said. “It made as five and zero against an old rival and a very good hockey club. The 10 points they’ve dropped to us would put them in a completely different position, which says a lot about where we’re sitting. “We were skating, we were tenacious, and we could have won it in regulation, but there was bit of adversity with two penalty calls, and when you look back at them, maybe one, but the other one was a weak one. “It left us to defend a six-on-three against one of best powerplays in the league, after we’d kept them off the sheet six times up until that point. Overall it was an improved performance on the previous two weekends which saw Flyers concede 20 goals. “It comes down to skating,” Dutiaume said. “Guildford don’t do a webcast so many people won’t have seen the performance, but they would’ve seen a team that was skating. “Against Nottingham, although we had a 24 hour road trip the night before, and we didn’t have as much juice as we did on Saturday, we were still skating. “A guy like Danick Gauthier was skating - it was evident that he was hunting pucks down and playing well.